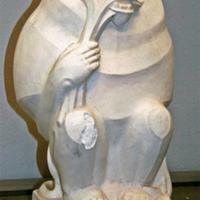 Plaster model of a seated baboon chewing on a plant. He holds the plant in his proper right hand. His knees are apart. 1 of 5 created for the 1939 New York Worlds Fair.